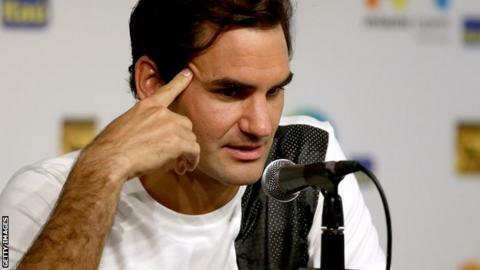 Roger Federer says the knee injury he suffered after the Australian Open in January occurred while preparing a bath for his twin daughters. The 17-time Grand Slam champion, 34, needed arthroscopic surgery to repair a torn meniscus and is set to make his return at the Miami Open this week. "I think I was going to run a bath for the girls," he said. "I made a very simple movement, turned back, heard a click in my knee. I went to the zoo. My leg was swollen." Federer said he was happy with how surgery went but "very sad" he had needed an operation. "I thought I was going to get through my career without any," said the Swiss. "It was a big shock and, yeah, disappointing." Federer is scheduled to face Argentina's Juan Martin del Potro in round two in Miami.